Atheodox Jew: Don't Break the Mitzvot - SHATTER them! Don't Break the Mitzvot - SHATTER them! "This implies that the mitzvot will be abolished in the future to come." In other words, it won't be a problem for the person to wear shatnez, because there will no longer be any halachic prohibition against it - or against anything else for that matter. There's a machloket (dispute) among subsequent halachic authorities over which commandments exactly will be abolished, and when exactly this will take place. The Gemara however simply says "mitzvot" (in general), so the straightforward understanding is that all the mitzvot will be null and void. As far as timing, it's implied from the Gemara that there will be no more mitzvot at the time of the resurrection. But the Gemara didn't use the words "techiyat hameitim" (resurrection of the dead) - it said "le'atid lavo" - "the future to come", referring to an unspecified future era, presumably connected with the redemption. All the Gemara is saying is that the mitzvot will be abolished by the time of the resurrection, meaning that the actual abolition may happen well before that. Fast forward a few dozen centuries. Here we are today, arguably having met the basic halachic criteria for the "future to come" in redemptive terms. The land of Israel has become fruitful, a substantial wave of "ingathering of exiles" has already commenced, much of the famous Mishna in Sotah has come to pass. And of course, since 1948 and the establishment of the State of Israel, we've essentially thrown off the "subjugation of the nations", which other Gemaras explicitly equate with Messianic times. The noted halachic authority R. Chaim Zimmerman indeed ruled that the State of Israel ushered in a new halachic era - atchalta d'geulah, "the beginning of redemption". It is now the "future to come" and the mitzvot are hereby abolished! Because there's too much judgment going around - judgment of oneself relating to the performance of mitzvot, not living up to God's or familial/communal expectations, and judgement of others - people overly fixated, anxious, angry, even belligerent over how or whether other people are keeping mitzvot. That is what I want to change - to pull the rug out from under that judgment. But where does that leave Judaism then, if there are no more mitzvot? Ok, so now let me be clear what I mean here. When I say the mitzvot are abolished, I mean "mitzvot" davka - i.e., that it's specifically the aspect of Jewish practice being "commanded" which is abolished. But the practice itself remains, to the extent that we choose it. (Such an interpretation is in fact brought in the Sefer Ye'arot Devash - the mitzvot are abolished, but we keep them anyway.) What I'm advocating therefore is not the abolition of Judaism - it's the abolition of "compulsory" Judaism, i.e., as something commanded/obligated from On High. Imagine practicing Judaism from a place of pure volition, as something that brings joy, meaning, and self-identity - without the guilt and neurosis, without it being a burden. Imagine being committed to Judaism out of the desire for national cohesion, positive, growth-oriented challenge, to infuse family life with a rich heritage of culture, ritual and thought - not because we're somehow ripping the spiritual fabric of the cosmos if we don't. Imagine engaging in Torah and mitzvot from a purely "lishma" place, with no motives other than wanting to learn and grow - not because we're being "watched over", not to obtain reward or avoid punishment. (As the above Gemara also states, there will be "neither merit nor guilt" in the future.) Imagine having no theological/ideological basis to condemn others (or oneself) for not conforming to ritual practices. ("Do not steal, murder" etc. are another matter, obviously.) No, not "imagine no religion" - IMAGINE JUDAISM as a much better, higher, more mature, tolerant, peace-affirming, joy-affirming practice - without all the strings attached. To tie this into the upcoming holiday of Shavuot, the abolition of the mitzvot is ironically all about "Kabbalat Hatorah" (receiving the Torah). Only instead of the heavy-handed, har kegigit ("keep the Torah or else") experience of Sinai that's come down to us throughout the generations, in the future era - i.e., NOW, we accept only what we want to accept, receive only what we want to receive. 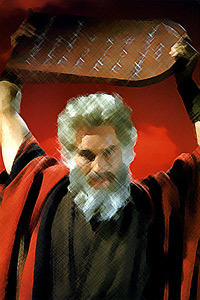 The first Kabbalat Hatorah ended with Moshe smashing the tablets of the law. It's high time for us to once again "shatter the tablets" - to abolish the mitzvot as a set of compulsory "commands", and simply embrace the best of our great Jewish heritage as a matter of personal and national choice.